Some border styles, such as the Diamonds border style, give you the option to change the number of blocks in the border by either using the arrows or typing in a number. For styles that allow you to change the number of blocks, the default is set to a maximum of 24. If you want to change that, click on the Worktable Options button on the Main Toolbar . 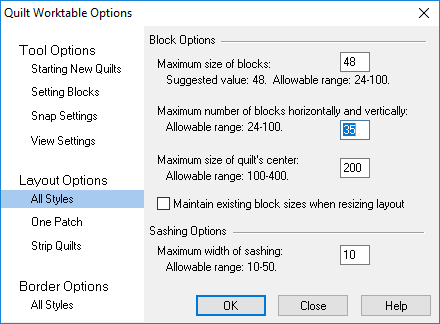 In the Quilt Worktable Options dialog box, click on All Styles under Layout Options and type in the number of blocks.